The super bowl two weeks ago, the start of the winter Olympics last weekend and now the BASSMaster Classic this weekend–life just keeps getting better and better! http://sports.espn.go.com/outdoors/tournaments/classic/index . I am not a big tournament angler, I have fished a couple, one way back as a teenager which I happened to win with a 3-pound smallmouth bass! I would love to enter a few tournaments, but do not feel I have the time to enter and do it right. If you are an angler today, you have been impacted by competitive fishing. There is no doubt that many of the advances that have been made in equipment and in strategies to find and catch fish have come about as the result of tournament fishing. Competitive fishing is a driving force behind the entire fishing industry and has been an important catalyst behind fisheries conservation. Even without the experience of participating in many tournaments, I will tell you that fishing tournaments fascinate me. If you put a bunch of good anglers on any body of water, most of the time someone will figure out how to catch fish. There are tournaments when the bite is tough and everyone will struggle to catch fish, but most of the time no matter how tough it is, someone will figure out how to catch some fish. Often the folks that figure out how to catch fish will do something entirely different than the local, traditional strategies and I am always interested in those new ideas. But beyond finding out about the latest and greatest baits used to win tournaments, I am most interested in the thinking that goes into a winning tournament strategy. Every tournament will present anglers with a series of decisions; should I fish close or run to a spot miles away? the fish quit biting, should I switch presentations and try to scratch a few more or should I run to a new spot? should I limit out with a bunch of average fish or swing for the fences and try to put a lunker or two in the livewell? Tournament winners are the ones that make all the right decisions while those who come up short will often have just one seemingly meaningless decision that comes back to bite them. Why did they make that decision? What were they thinking? How did they get in that “zone” where it seems everything they do seems to come up roses? I believe that is where the real lessons are to be learned from a tournament and as I watch the coverage of the BASSMaster Classic this weekend, those will be the kind of details I will be trying to learn. Buck Perry, the “father” of structure fishing said a long time ago that “knowledge is the key to success”. I believe that is true and that is why I believe there is a lot to be learned from fishing tournaments whether you fish in them or not. Even a weekend angler could benefit from knowing those tournament-winning strategies and thinking. Honestly, I wish the BASSMaster Classic was still held at the end of the B.A.S.S. tournament season. I know they had some tournaments like the one in Pittsburgh under that format where darned few fish were caught. I know that is not the kind of “splash” and excitement they are looking for in tournament coverage. But you know what? When the fishing is tough is when the best sticks rise to the top, and I believe there is even more to be learned from a tough tournament than an easy one. But I will still be interested in the Classic, even though it is now held in February and will always be held on some far-south fishery. It is fun to follow and cheer for your favorite anglers as well, GO KVD! Let's see those "fancy pants" BASS pros come up here and catch some bass right now! Ha! Not to mention a certain “Fish Recyler” is down there! Thanks Daryl. I have a VERY narrow perspective of fishing… because EVERYTHING I KNOW is either from FISHING or READING ABOUT fishing! There is sooo much that can be learned from/by fishing with others. Sure would like to do some of THAT this year. Thanks for a great read Daryl. I saw an update yesterday–first day of practice fishing for the Classic was in the snow! Snowing hard in Alabama! And those tournament anglers were worrying about water temps. in the 40’s. I would rather be on the ice! As a matter of fact in the past week I have caught enough bass through the ice that I might be doing well if I had those fish in the Classic! 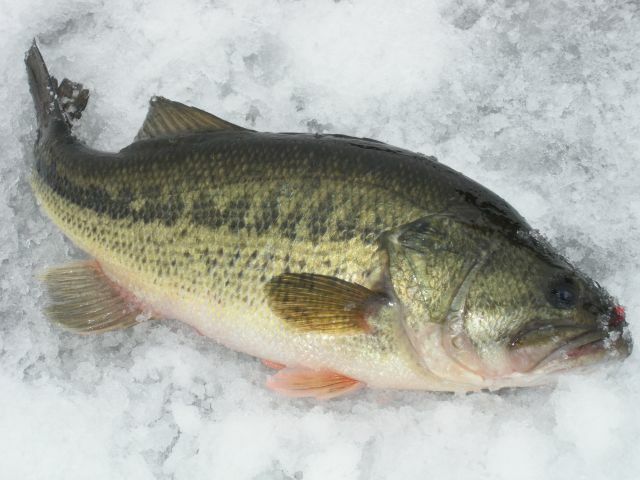 I would think with cold water and snow, the bass pros from “up north” might have a better shot. I will stay with my first pick–Go KVD. I’m with you on the KVD pick,I root for him anyway, but with tough conditions he always seems to rise to the top and put enough fish in his boat. If you watch future tourneys, root a little for Jami Fralick. He lists Martin, SD as his hometown but he spent a lot of his life on the Springfield Marsh above Lewis & Clark. He’s up to 3 Classics now and is a humble, nice guy that’s been doing a good job on the Elites.